It's easy to change settings in the Mail experience in the new Outlook.com so it looks and behaves the way you want it to. To find the most frequently used Mail settings, select Settings . 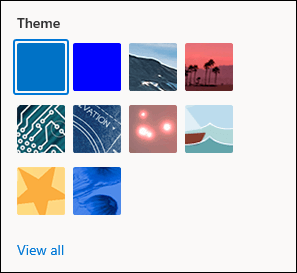 Under Theme, choose from one of the themes displayed. You can also select View all to choose from more options. Dark mode switches the color scheme from a light background to a dark one. Turning on dark mode can reduce eye strain in low-light environments. To learn more about dark mode, see Dark mode in Outlook.com. Conversation view groups your messages by conversation. You can view conversations with the Newest messages on top or Newest messages on bottom. If you prefer, you can turn Conversation view Off. You can configure the Reading pane by selecting Show on the right or Show on the bottom. If you don't want to use the reading pane, select Hide. When Focused Inbox is on, Outlook.com automatically sorts messages in your Inbox into Focused and Other tabs to help you focus on what matters most. If you prefer to see all your email messages in one place instead of having them sorted into Focused and Other, slide the toggle left to turn it off. Note: This setting applies only to your Inbox. If you don't want to see a photo of each sender in your message list (or the sender's initials, if a photo isn't available), slide the toggle left to turn it off. By default, messages in the message list are sorted by date with headings dividing them, for example, Today, Yesterday, This month, and more. If you don't want your messages sorted by date, slide the toggle left to turn it off. When the Attachment preview toggle is turned on, a preview of attachments will appear in the message list. If you don't want to see previews of attachments, slide the toggle left to turn it off. By default, Outlook.com shows three lines of information for each message in your inbox: sender, subject, and part of the first line of text. If you want to condense your message list or don't want the first line of message text to be visible, slide the Message preview text toggle left to turn it off. To find other ways to personalize your Outlook.com experience, scroll to the bottom of the Settings pane and select View all Outlook settings.